It’s difficult to believe that we are already in December. Well lol as I’m writing this is still November and we haven’t even had Thanksgiving yet. I needed to get my post ready extra early because I will be traveling and not home when my post is due. When do you travel the most? Our family has never traveled much in the summer months due to my husbands job. It’s really unfortunate too since I worked in a school for several years and before that I taught piano lessons–summers were my slow months. Anyway, this past fall has been a whirlwind of travel for me–I don’t travel much usually. In October I was in Seattle for a week and then my husband and I were in Florida for a week in November. We were able to meet up with his aunt and one of his cousins on our first day there. :) We have no set plans for anymore travel. I wanted to let you know about a book I released not long ago. It’s called Simply Smitten. It’s the next book in my Brides of Seattle series. I seriously love this cover. At first I thought the font was too cotton candy-esk, but once I committed to it, I fell in love with it. I must give my cover artist props for taking what I envisioned in my mind and making it come to life. Here’s the back cover blurb for the story. Hailey O’Brien, a recent economics graduate is practically handed her dream job, but there’s a catch. Her new boss allowed her to believe he was someone he was not—they bonded on the train ride to Seattle, and now she is smitten. On top of that, her hometown is where her estranged mother lives. Can she mend the riff with her mom and follow her heart back to Seattle? Or will their past be too large of a hurdle. 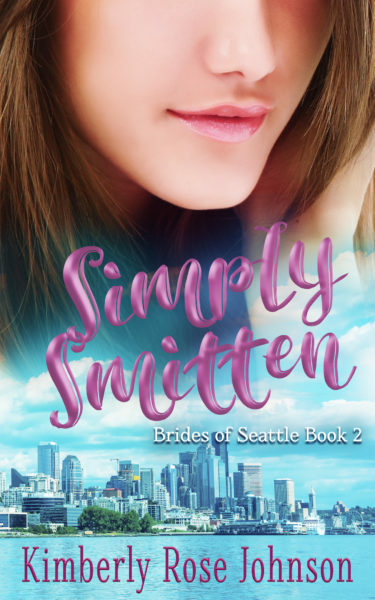 You can find Simply Smitten on Amazon. Will you be traveling for Christmas? Or perhaps you traveled someplace for Thanksgiving. I’d love to hear about your adventure or where you’ll be heading. Hi Kimberly! Love the cover! This year we traveled over Thanksgiving, a new adventure for these retirees. We visited a German Christmas Market in Carmel, Indiana and the Indiana History Museum. Fun adventure. Best wishes! Hi Renate- the German Christmas market sounds great, I would love to explore. There is a town in South Australia called Hahndorf that has a wonderful shop that sells German wood craft-fantastic. That sounds like such fun, Renate! Hi Kimberly, love the cover- it is very eye catching. We normally travel over the Christmas holidays- summer for us, and our long break of the year. Our family all live interstate, so we are often travelling to visit them. This year however, we are staying in our home state and doing some hiking, sailing and general exploring around home. We also need to spend a couple days making jam as we are running low!! Hi Weeble – wonder if Rooster village has lots of roosters? I have done a lot of travelling over the years. Less so now, but it is always enjoyable. Merry Christmas, Lucy! It sounds like you had a nice Thanksgiving. This sounds like a lovely story, Kimberly! I do not get to travel any at all, between expenses and health, it’s just not doable, so I do my traveling in BOOKS! Traveling via books is how I usually visit new places too. Happy travels, Paula! I love the cover and the font! No, we won’t be traveling this year for Thanksgiving or Christmas. Usually we travel from Maryland to North Carolina (where hubby is from) for one of the major holidays, but this year, it’s just not feasible. I do love traveling though! I used to work in a travel agency and I would take a trip or two each year. I LOVE international travel and it was interesting visiting the different countries! A travel agent! Very cool. I imagine you miss the perks. Staying home can be very special too. We love road trips! There’s so much to explore in Western Canada and the PNW of the USA. We tend to travel in May/June or September, when the weather is (usually) lovely but there are fewer vehicles on the road than in the height of summer. Really enjoyed Simply Smitten! I’ve never had the privilege of traveling by train. It’s on my bucket list! You should definitely try the train some time, Valerie. I recommend a shorter trip over a longer one though in case you hate it. :) I was on a train one in Canada and it was super rocky–I had horrible motion sickness from that ride. Amtrak is much smoother. We didn’t think we were traveling for Christmas, but my two nieces can’t come to us, so we may try to go to them. Oh no–no sleeper? That’s a long trip. I’d fly too! When I was a kid we took Amtrak from CA to OR and it felt like an eternity. We don’t travel around the holidays since both sides of our families all live here in our little area. It is nice! The traveling time for us is spring and summer when we go camping two hours away to Lake Michigan. No travel for Christmas for us, except to drive to Nashville to pick up my daughter and her fiance! Someday I want to take the train from Illinois to California. We had a friend who did that and loved it! I would have to have a sleeper, though! Your book sounds great! Can’t wait to read it! Thanks, Regina! When I rode the train from Leavenworth to OR the train had been in route from Chicago. I ended up writing a couple of scenes in two different books with characters who came on the train from Chicago. :) Have a great Christmas. Hi Kimberly?Have you visited the German Christmas Market in Leavenworth? A Bavarian-style Christmas Market. Includes entertainment, authentic Bavarian foods, handmade arts & crafts and other gifts, a lantern parade, and Santa Claus as well as the Christkind and St. Nicholas! My husband love the Bavarian feel to the town. Love visiting train stations. My favorite memories are of NYC Union Station, but am familiar with the one in Chicago. Renate, I’ve been to Leavenworth many times but not the lighting festival. I only seen it on a video and read about it. I will be home in CA for Christmas. A few years ago, though, my mom treated my brother and me to a Christmas week cruise to Mexico!! I imagine that was a unique experience! Merry Christmas, Linda. This cover is very catchy and colorful.